tbprocess: Manages requests for batch processing of vectorized drawings or rendered scenes. When you ran the Harmony Configuration Wizard, you had the option of having batch processing on your system. 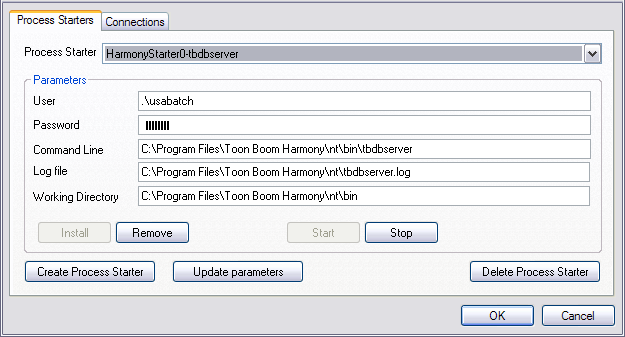 If you selected the Yes option and had a valid license, the tbprocess starter is ready to run; otherwise, you cannot perform batch processing on Harmony. tbdbserver: When you have a Server/Standalone configuration, this function controls the entries you make to the Harmony database (like adding new scenes to a job). NOTE: When you run the Toon Boom Harmony Configuration Wizard, it automatically configures your system to launch the tbdbserver, so you do not need to configure anything else. From the Start menu, select All Programs > Toon Boom Harmony [version] > Tools > Control Panel. Select the Process Starters tab and select a specific process starter to view its parameters. User: Displays the profile that the process starter uses by default. Password: Displays the password for the user specified in the User field. Command Line: Displays the path of the application you want the process starter to launch. Log File: Displays the name of the log file that records all the messages from the application specified in the Command Line field. Working Directory: Displays the path that contains all the applications you need and where these applications can store data while they run. Make any modifications you need to the existing services and click Update parameters.